Open Studios is this weekend and more than 200 artists will be participating. There will also be a number of public art installations. 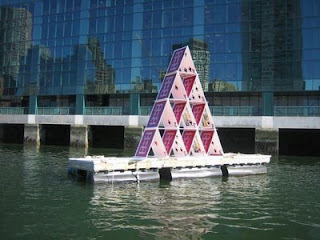 "House of Cards" by Lisa Greenfield will be floating in the Fort Point Channel between Summer and Congress Streets. Tom Wojchiehowski's 100' "Light Words" will use the light from Fort Point landmarks and cityscape to spell out words with images that celebrate the neighborhood. And Nicole Seisler will physically tie together opposite ends of the Fort Point neighborhood with "Out in the Studio", a performance and installation using hand-thrown, raw clay vessels. In addition, at Midway Studios, 8:00 pm October 17 and 18, 2008, Fort Point Theatre Channel will present two evenings of contemporary music featuring Ensemble Warhol. The program includes Tierkreis, by Karlheinz Stockhausen, and the Voyage of the H.M.S. Beagle, by Mark Warhol. Ensemble Warhol consists of Naomi Gurt Lind, soprano, Donald Wilkinson, baritone, and Meghan Miller, flute. For a map of map of studio buildings and more information, see the FPAC website: www.fortpointarts.org. Hope to see everyone out this weekend!